Squirrel Girl has met a mysterious benefactor who has given her a flying squirrel suit that’s definitely reliable and trustworthy! All is fine in the world, yes? You may be saying “yes, of course, and it certainly sounds like this is going to be a refreshingly calm and event-free issue of my favorite talking squirrel comic,” but if you’ll recall what the last few pages of our previous issue dramatically revealed, you’ll remember that, no, we’re actually all in a lot of trouble! Squirrel Girl is being manipulated by someone whose motivations nobody knows; Nancy is struggling with a challenging programming problem off-panel (which is why you didn’t see it in the last issue, but don’t worry, she’ll figure it out); AND a chicken named Alfredo is in a high-stakes battle for his very life! Gasp at a secret invasion of character motivations! Thrill at a chaos war of emotions! Boggle as monsters truly get unleashed and Doreen’s fate hangs in the balance! 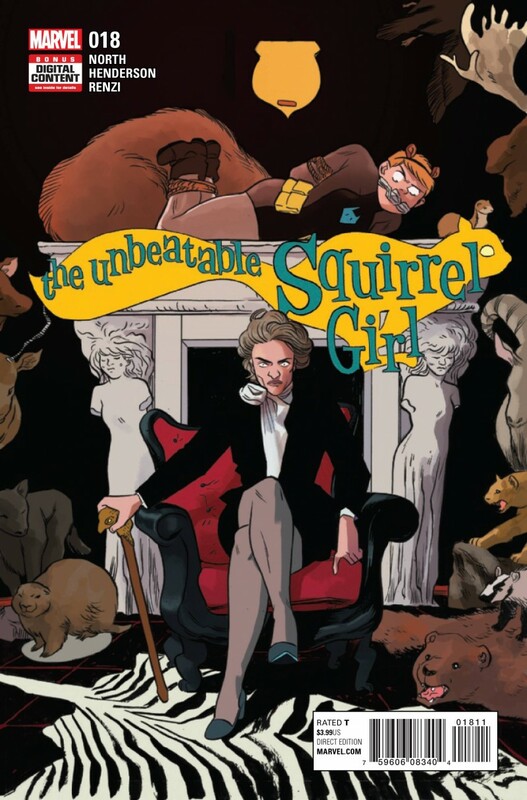 Squirrels and girls and punching, oh my!